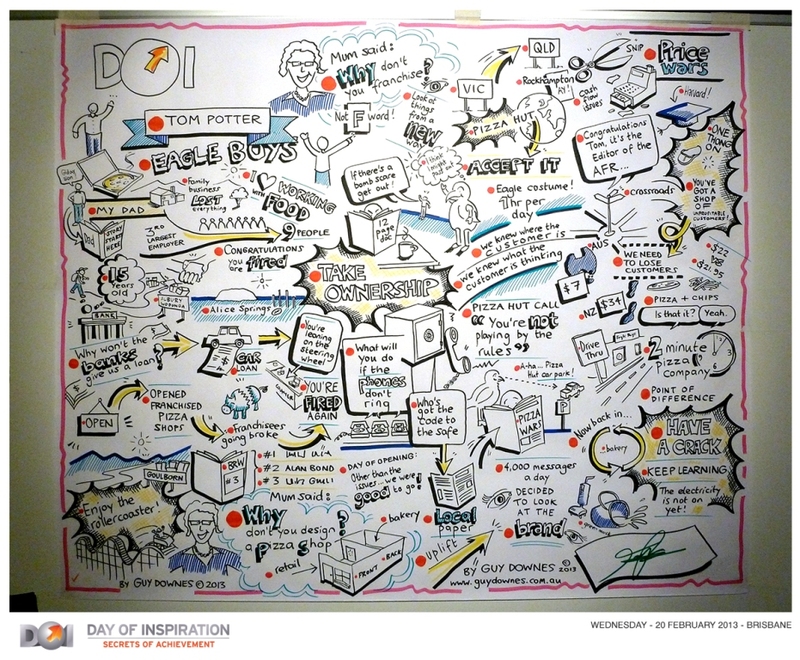 I’ve been involved as the graphic recorder at the Tour De Cure’s Day of Inspiration “Secrets of Achievement” for three years now and the event and the speakers seem to get better and better. 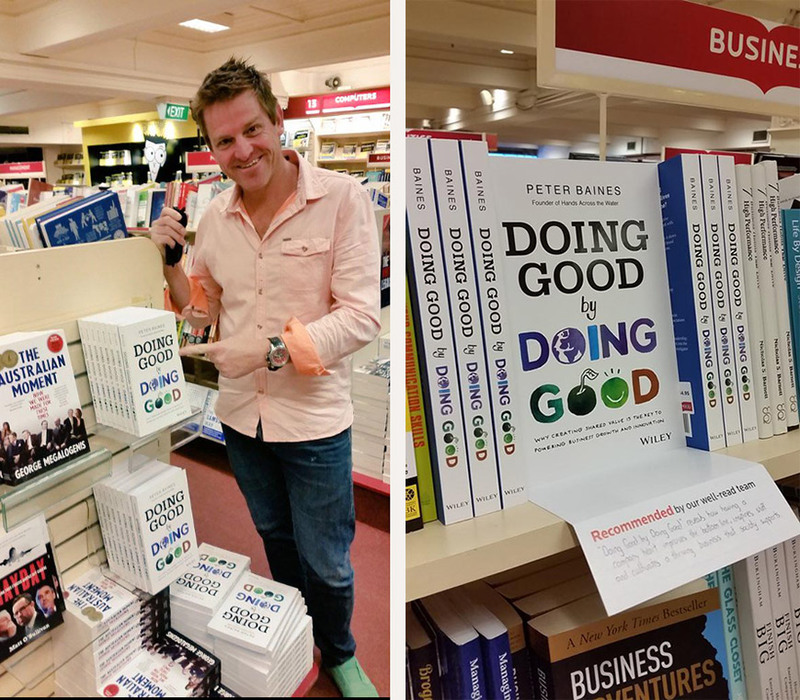 With inspirational speeches from some of Australia’s best speakers, the one day event helps raise much needed money, awareness and support in the fight against cancer. I graphic recorded absolutely ‘knock out’ speeches from the likes of Paul de Gelder (Navy diver/shark attack survivor), Dr Charlie Teo (world famous neurosurgeon) and Cosentino (the grand illusionist) among others. Here are some of my graphic recording posters (which were all about 4ft x 3ft in size and covered speeches that lasted 20-30 minutes). 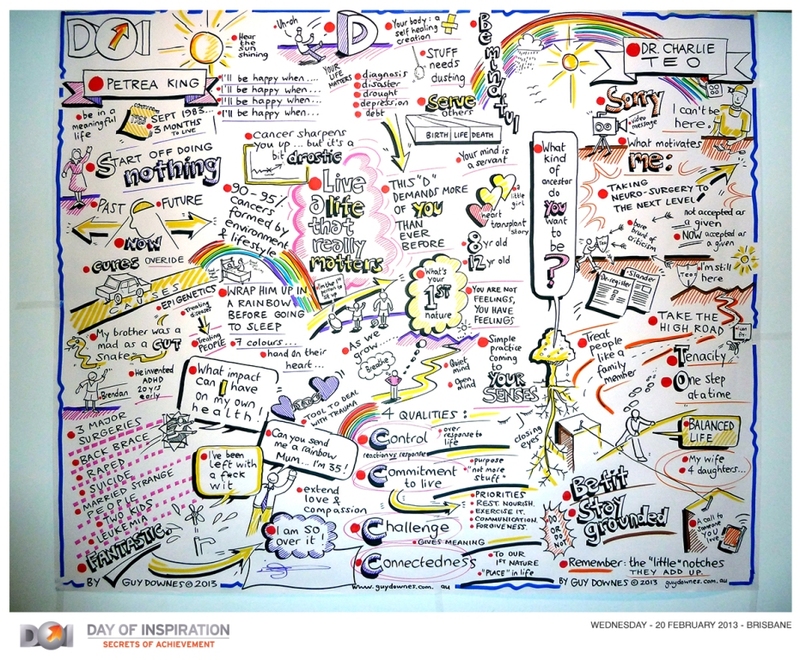 To see more detail, they can also be downloaded in full at the Day of Inspiration website – just go to the Mind Map sections at the bottom left of the main page. Following on from the first video scribe animation two years ago, I recently created a new video scribe animation for the National Union of Workers (NUW). 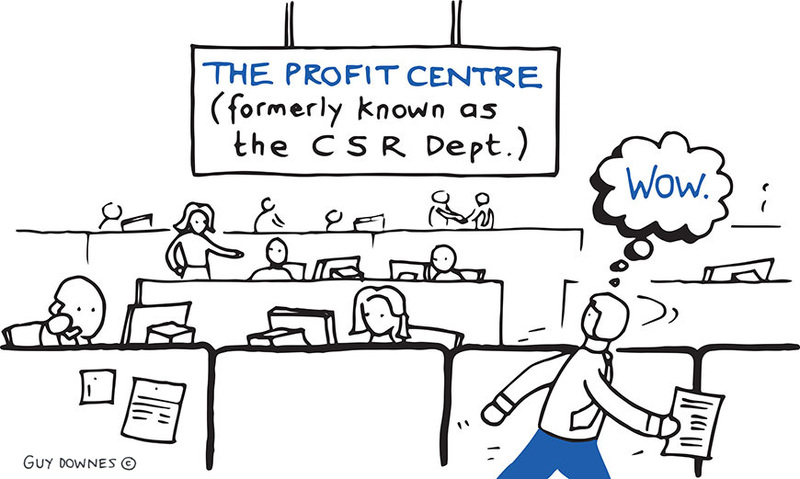 The video scribe animation continued the NUW “Jobs You Can Count On” campaign and storyline on a topical issue in Australia: job security and the casualisation of the workforce. However, the new video scribe animation was created with several new dynamics. Firstly, the animation was developed as one whole story made up of three key sections, which could be edited in post production so each section could also be a ‘stand alone’ video scribe animation. Using a sketch book style approach with ‘page turns’ helped achieve this. Plus, this latest video scribe animation included props, sound tracks, sound effects and animation effects. The audio features the voice overs of Tim Kennedy, Victorian Branch Secretary, NUW and an NUW employee. If you watch it, make sure you watch it on full screen and turn your device volume up for full effect. 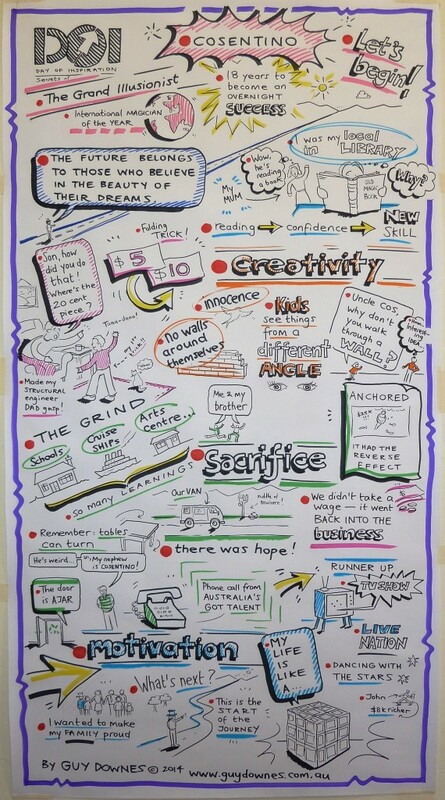 Graphic recording using illustration, colour and words to capture key ideas. Here’s some of my graphic recording work from an event at The Institute of Early Childhood at Macquarie University, titled: “Unpacking Place, Pedagogy and Documentation”. Led by Semann & Slatery and the institute, the event unpacked ideas around the educational experience of Reggio Emilia in Australian and international contexts and to build on known understandings and challenge assumptions. My graphic recording poster above captures five different presentations and the subtle colouring and shading per section (e.g. purple, green, blue, pink and orange) helps group the graphic recording content. 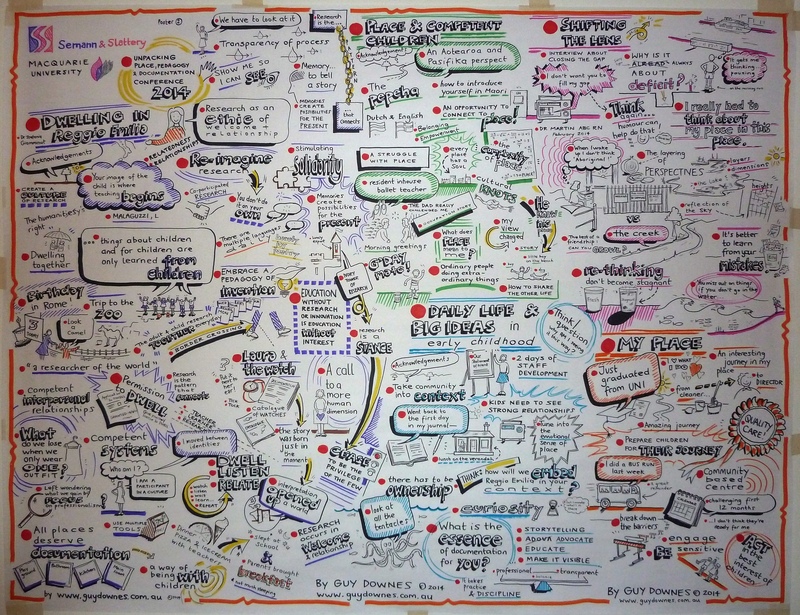 It was fantastic to graphic record presentations by thought leaders in this space such as Janet Robertson, Dr Stefania Giamminuti, Kirsty Liljegren, Anthony Semann, Associate Professor Karen Martin and Associate Professor Alma Fleet among others. Delegates taking snaps of my work as it evolves on their smart phones and devices. 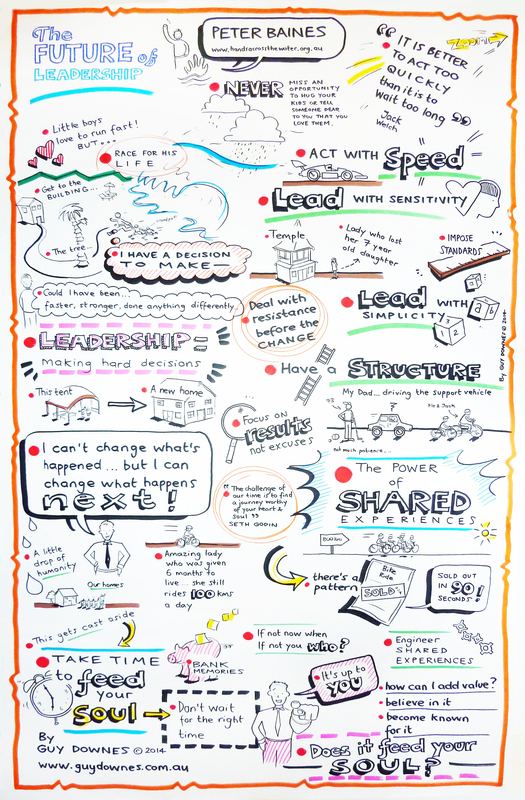 My graphic recording poster from the HP Software Canberra Forum plenary. 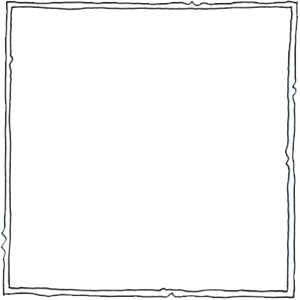 Click on the image to increase its size. 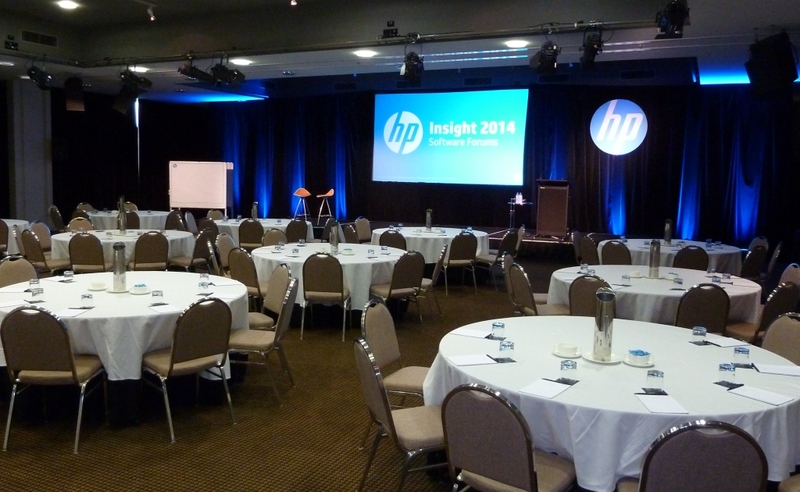 I recently graphic recorded three HP Software Forums called “Insight 2014”. 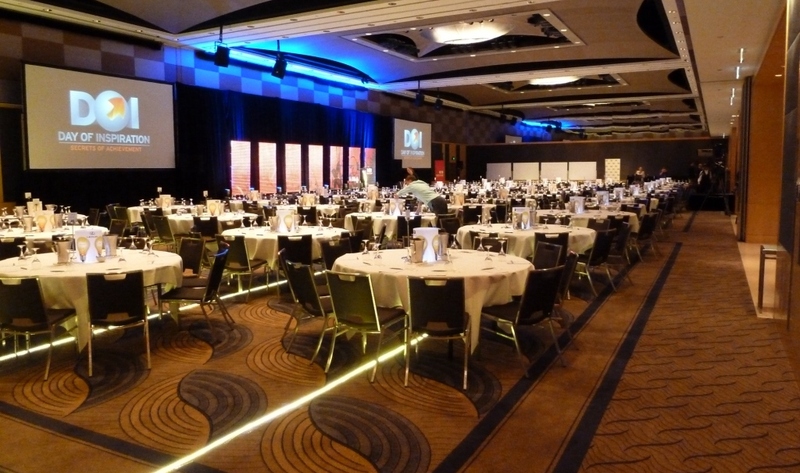 Held in Melbourne, Canberra and Sydney, the HP events provided the latest information for HP Software customers. 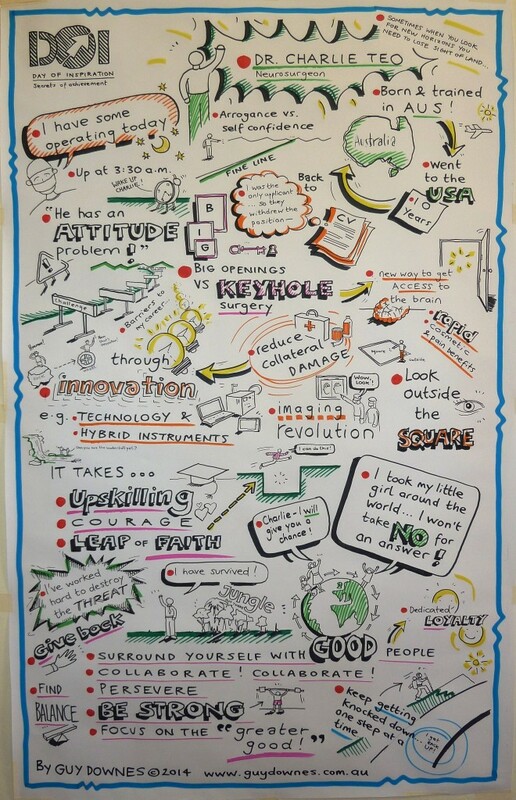 As the graphic recorder, my role was to visually capture the key points and themes from the main presentation on “Connected Intelligence: the New Style of IT”. My posters were shared on the HP Software online forum so that attendees had a visual and engaging memory tool from the event that could trigger memories, help them remember key insights but also spark new thinking. 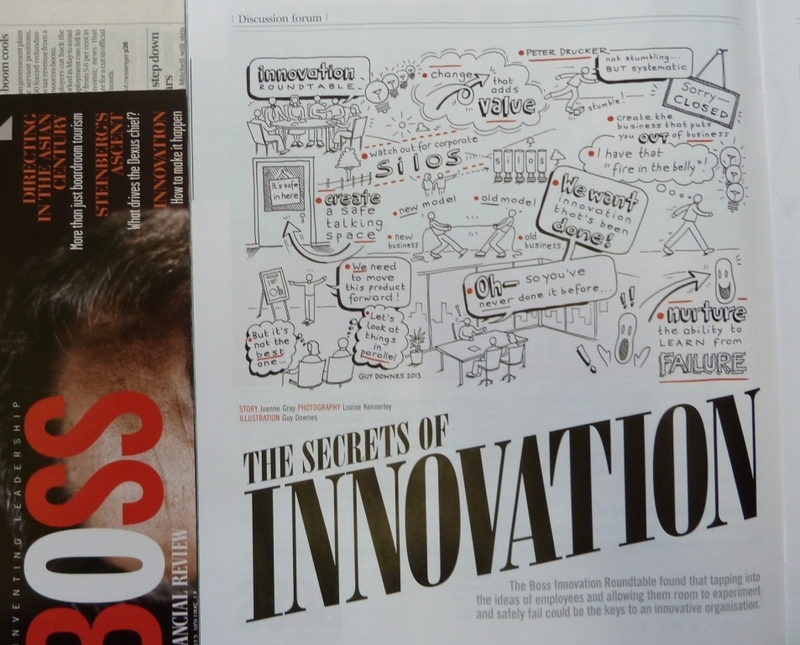 You can see a photo of the venue room below with my graphic recording work station in the left hand corner. 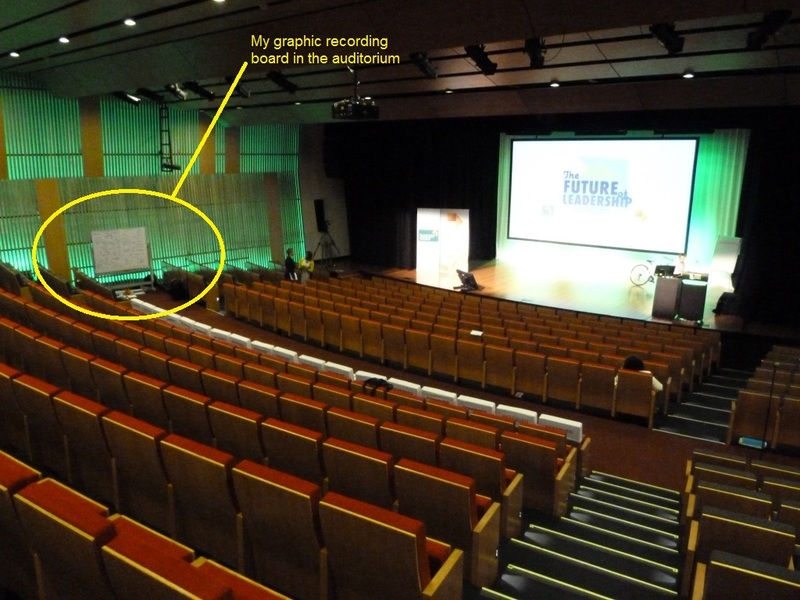 My graphic recording work station can be seen to the left of the main stage. Stories come in all shapes and sizes. I recently painted a large-scale educational mural for Calrossy Pre-school in Tamworth, NSW, which is one feature in a fantastic new ‘discovery’ garden where the children can explore, play and interact with and learn about nature. With the story of a sailing boat race in Sydney Harbour as the core thread through the middle of the painting, the bright and eye-catching mural plays out stories below and above the surface of the ocean. The level of detail was intentional to draw the viewer’s eye into the many underlying messages and ‘stories within the story’ to help spark interest, learning, imagination and, above all, little moments of joy. Datarati StopKeepStart 2014 – Visual Scribe Artist Timelapse video from TEN ALPHAS on Vimeo. Graphic recording at the Museum of Contemporary Art overlooking Sydney Harbour is a great way to start the day. 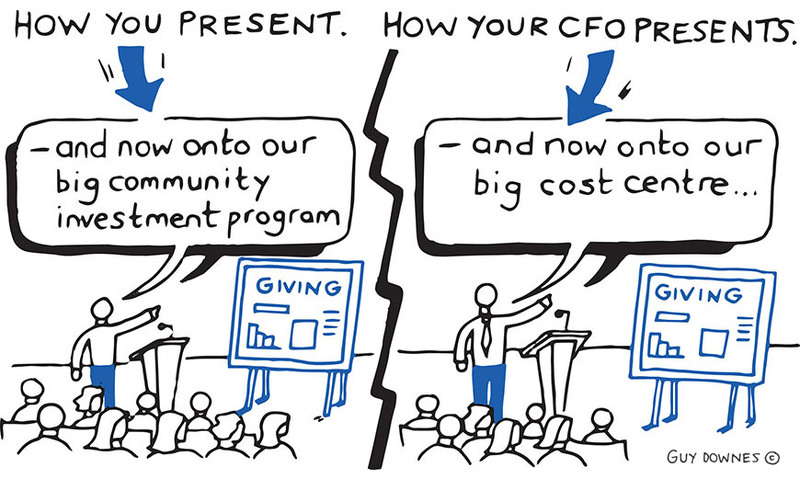 And graphic recording a marketing event with a unique twist and stand out format made it even more interesting. Marketing automation company, Datarati, invited over 80 clients for a workshop breakfast to discuss what they were going to Stop, Keep and Start doing in 2014 around four pillars of marketing. The findings were then presented for an hour to the room and to a live webcast audience. 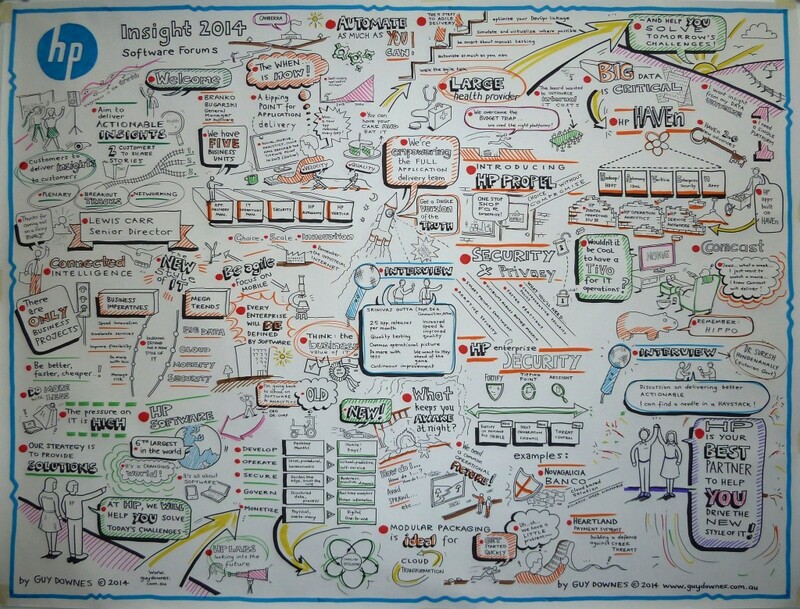 My role was to graphic record the findings presentation and panel discussion. 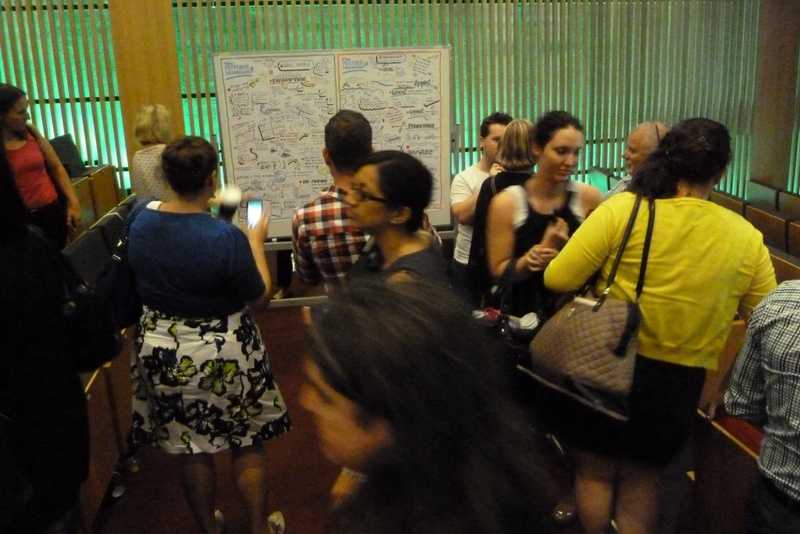 It was fast paced, reflected in my ‘insight loaded’ graphic recording poster. 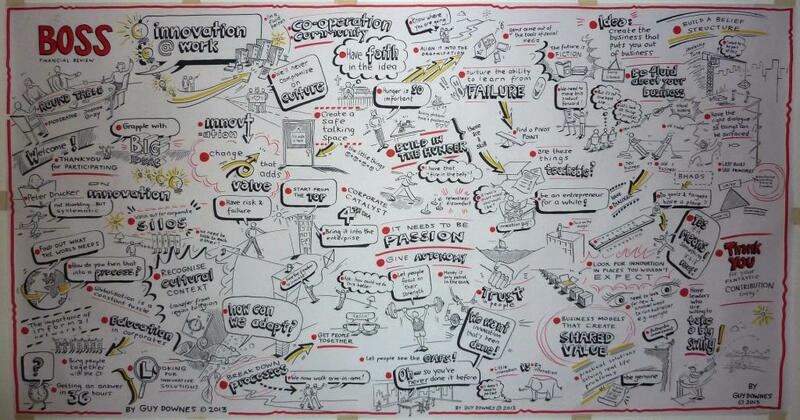 Here’s a time lapse video of me graphic recording during the event. 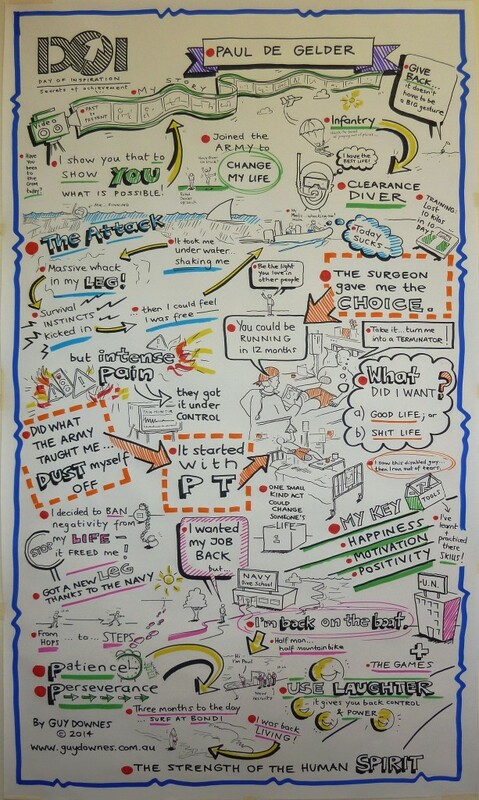 The video of the findings and my final graphic recording poster can be seen at stopkeepstart.com Thanks to production company Ten Alphas for inviting me to graphic record the session. 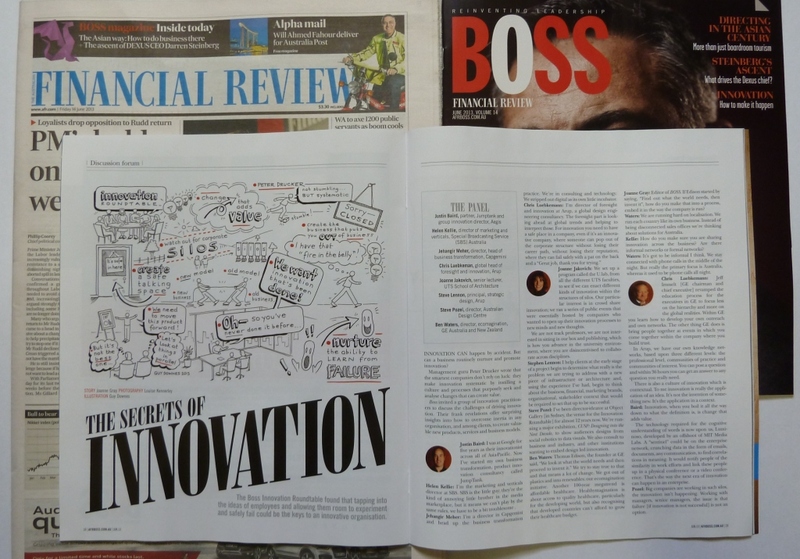 Today’s AFR BOSS features my graphic recording and follow-up illustration work from a recent fantastic roundtable discussion and subsequent article on “The Secrets of Innovation”. 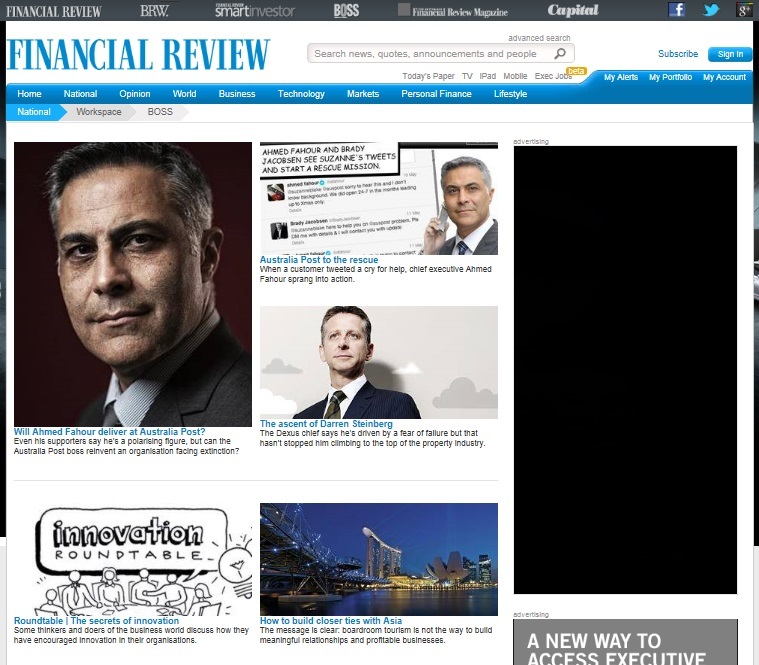 Speakers included thought leaders from ARUP, Jumptank, Aegis, SBS, Cap Gemini, UTS, Australian Design Centre and GE. 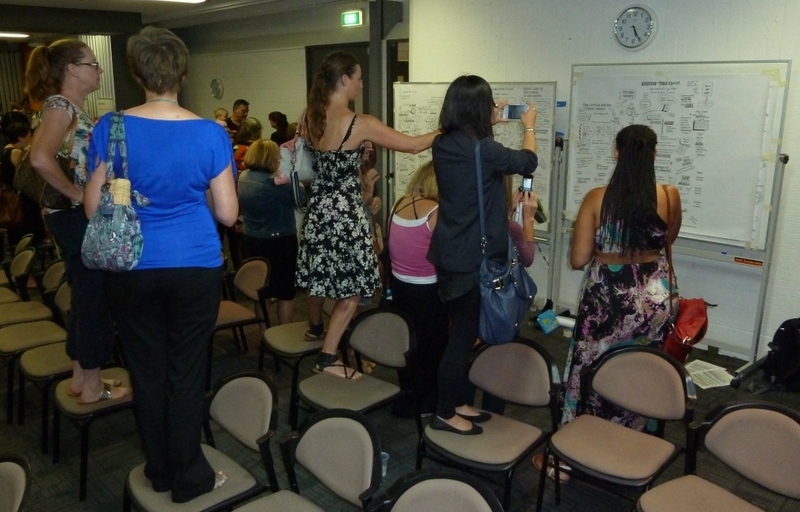 My role included being the graphic recorder (or ‘visual note-taker’) on the day and you can see a photo of me within the article in action capturing the essence of the discussion in pictures on a large poster. I listened intently to the discussion and drew ‘live’ the big ideas, issues, opportunities and broad themes that were being covered in the discussion – the result being a 2.5m x 1m poster, which acts as a creative visual record and group memory tool to spark further thinking, ideas and conversation beyond the roundtable. 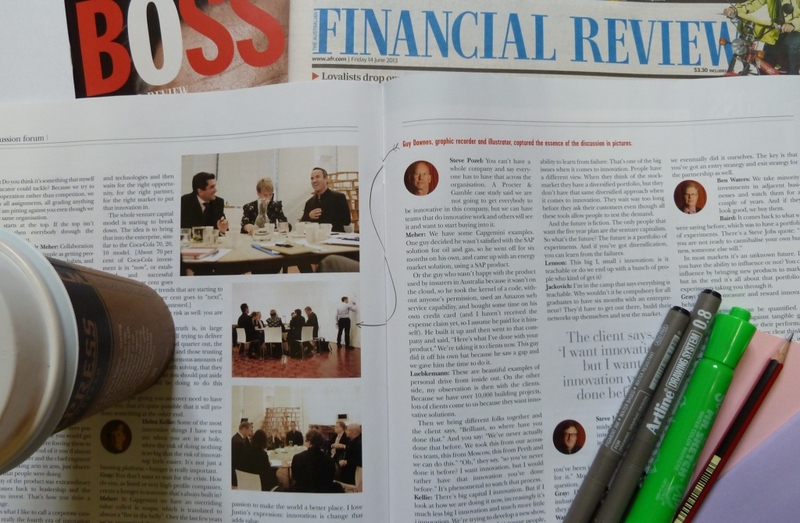 I then worked with the editor of AFR BOSS, Joanne Gray, to distil the best points from my graphic recording poster into an illustration for inclusion in the article. 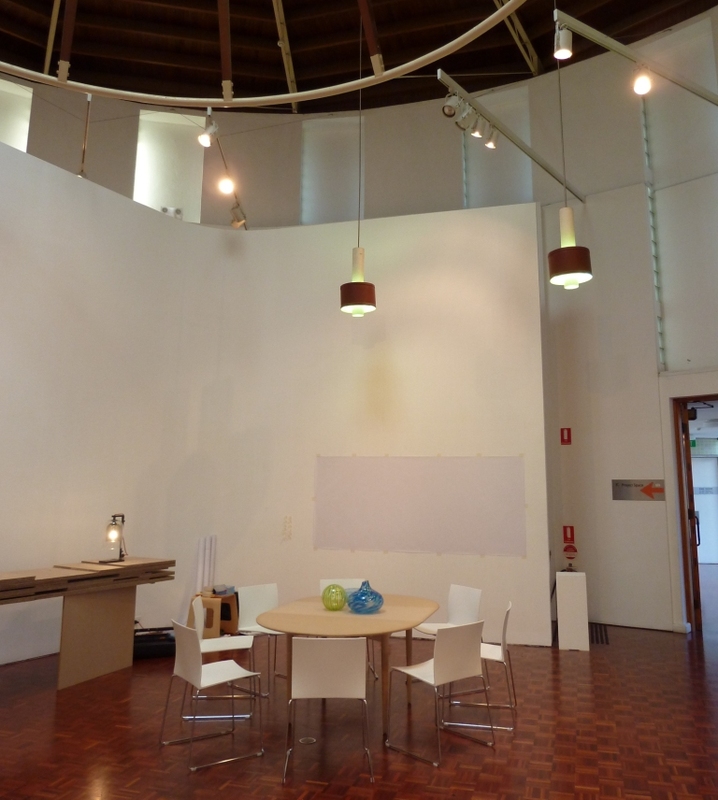 The roundtable took place at the wonderful Object Gallery in Sydney. 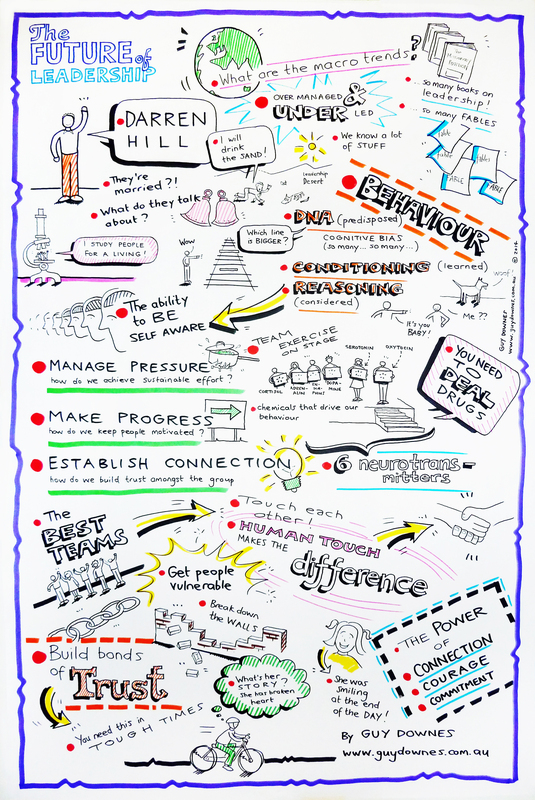 My graphic recording poster (2.5m x 1m) capturing the essence of the discussion at the event. Once again, I had the privilege of graphic recording the inspirational speeches from some of Australia’s most inspirational speakers at this year’s Day of Inspiration “Secrets of Achievement” – a stand out event raising much needed money, awareness and support in the fight against cancer. Here are some of my graphic recording posters (which were all about 4ft x 3ft in size and covered speeches that lasted 20-30 minutes). 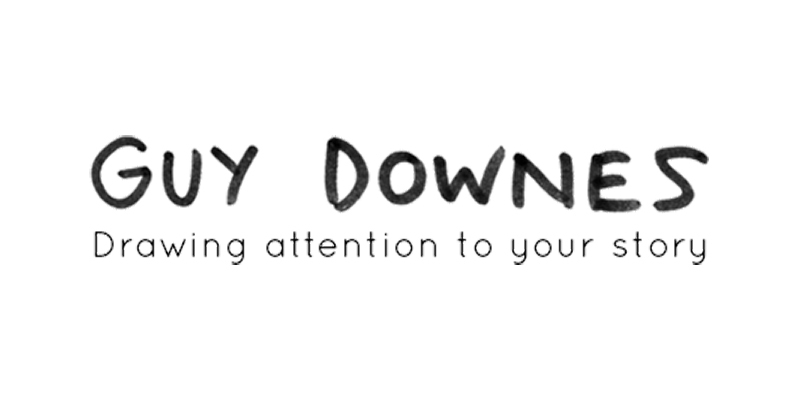 To see more detail, they can also be downloaded in full at the Day of Inspiration website – just go to the Mind Map sections at the bottom of the main page. 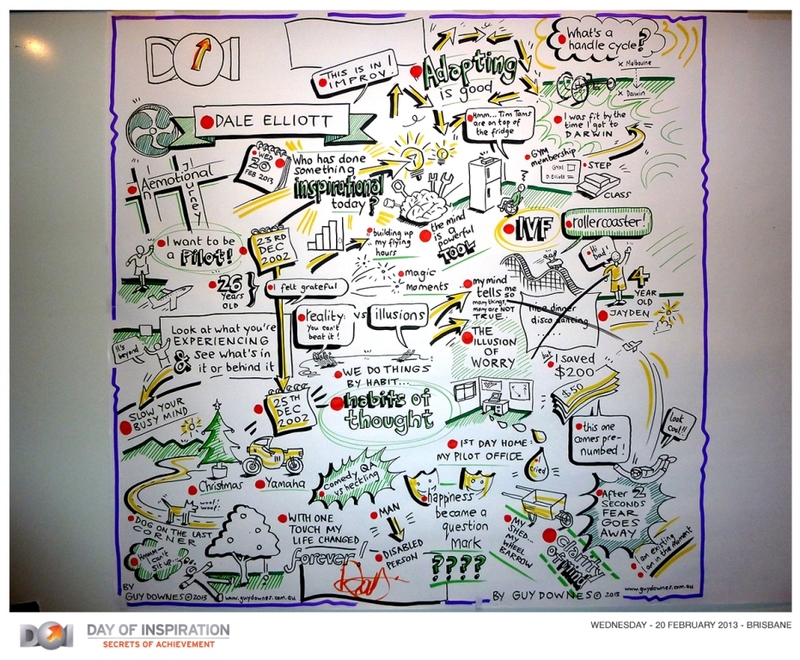 Graphic recording poster of Dale Elliott’s speech. Joint graphic recording poster for Petrea King & Dr Charlie Teo’s speeches. Graphic recording of Tom Potter’s speech. 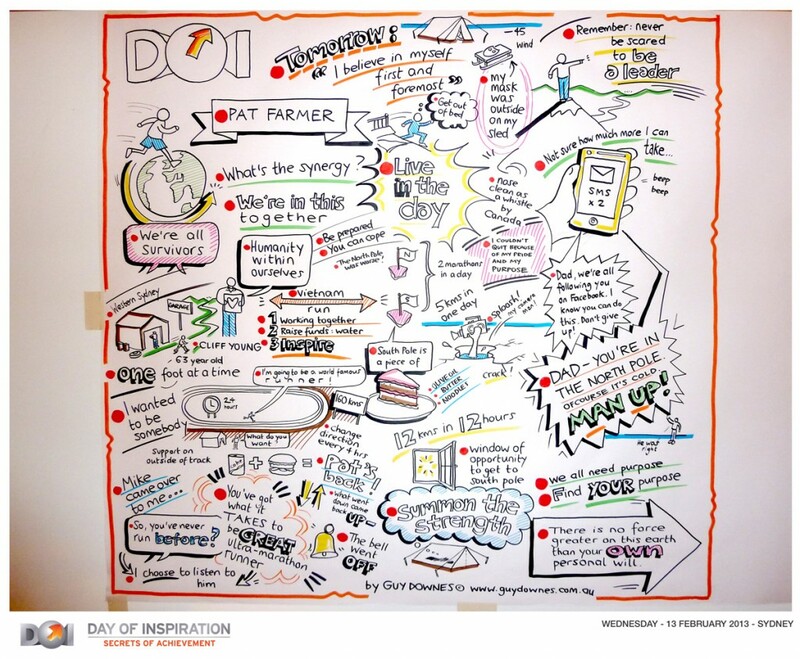 The DOI 2013 venue with my graphic recording boards in the background.